I once again see disturbing trends rearing their ugly heads in the U.S. housing market. Twelve years ago, I warned about the housing bubble long before it burst—then living in the Washington, D.C.-metro area. Now my vantage point is San Diego, where home prices soar and sales (finally) start to stagnate. Justification, set against measurable trends, often is a fantastic measure that something is amiss. Metaphor: In film “The Big Short“, set during last decade, a Florida real estate agent drives around a group of Wall Street investors trying to discern whether or not there is a housing bubble. As they pass property after property for sale, she explains: “The market is in an itsy-bitsy little gully right now”. Eh, yeah. That gully later became a giant sinkhole. This morning, I received a newsletter from a local realtor that claims: “Pending home sales were sluggish in April as low supply reared its head”. Crazy thing, I see plenty of inventory for sale—and for increasingly longer times today than four or five months ago. The newsletter’s assertion rings like a justification worth concern. The Median price of a home in San Diego is $572,000—from combined sources, current May 31, 2017. That’s up from about $420K four years ago. Talk of inventory shortages is hardly new for the area. The common complaint goes back at least seven years, based on my quick review of real estate sites and local paper stories. What’s different now, or so I say: Prices have reached the peak that the current buying market can tolerate. Signs are plenty. For example, a realtor recently confessed that she is starting to see numerous homes assess for less than their listed selling prices. That’s a new trend, she said. Turnover is slower, at least in my neighborhood, where slashed selling prices are increasingly common. Last week, while casually chatting with a mortgage lender, he said that San Diego tends to be the barometer for California home sales. The market typically heats faster and cools as quickly. Consider that median house prices peaked here in 2005 and started slowing soon after, well ahead of most other bubble areas. The idea that low inventory slows sales is nonsensical. Macroeconomic factors, far-reaching beyond SoCal, tell a different story. For example, in the most recent weekly survey from the Mortgage Bankers Association, mortgage applications decreased 7.4 percent from the previous seven days. However, that’s on what the organization calls an “adjusted basis”. Unadjusted, the decline was 26 percent. Higher interest rates appear to be the speed bump slowing buyers. Rate increases aren’t exactly exorbitant. For the 30 year-fixed mortgages with “loan balances greater than $424,100” rates nudged to “4.19 percent from 4.10 percent”, according to the association, for example. 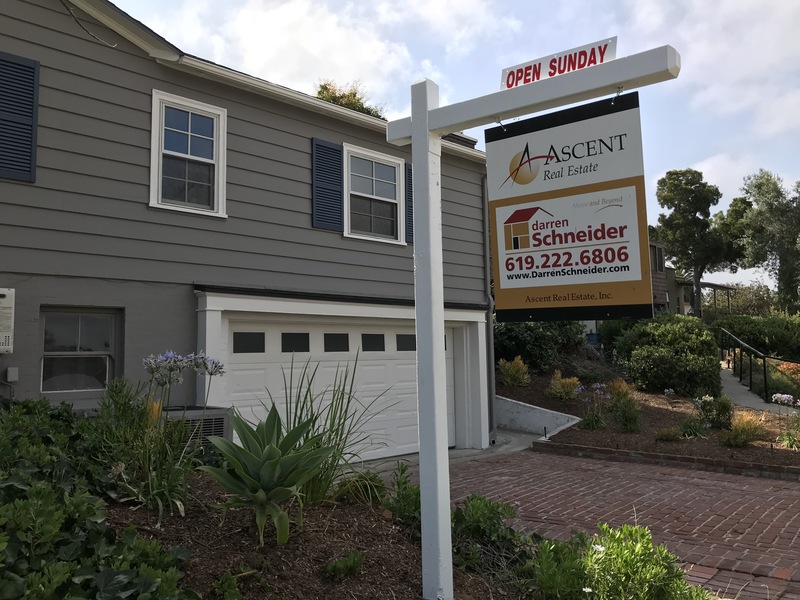 In some markets, San Diego being one, where many home values have risen back to amounts owners owe, rising rates and fear of more would be reason for more inventory to come to market. Better to sell while you can and when realtors and news sites claim their is too little inventory that makes a seller’s market. There is little sign that’s going to happen. Nationally, unemployment may be low, but troubling trends remain. That’s a topic for a future analysis, when I have spent more time scouring economic data and can carefully assess what they could mean. However, I see cracks all through the economy that defy the stock market’s epic bull market. The canary in the coal mine, so to speak: Excuses and justifications from players in key segments with something to lose should sands shift beneath their status quo. Housing is one, among many.